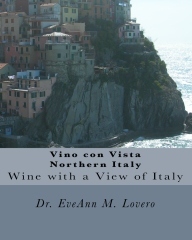 Vino con Vista Arles is a UNESCO Site. 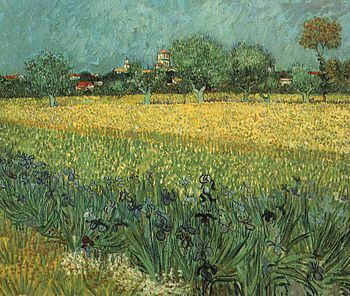 Even though Vincent van Gogh was Dutch, like most post-impressionists, he found the light and landscape of Provence magical and inspiring. He died at the age of 37 from a self-inflicted gunshot wound. 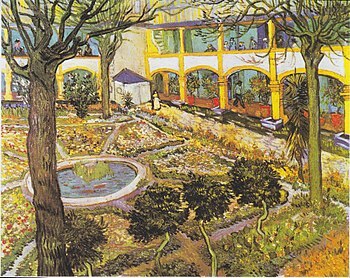 Arles was one of his favorite destinations in southern France. 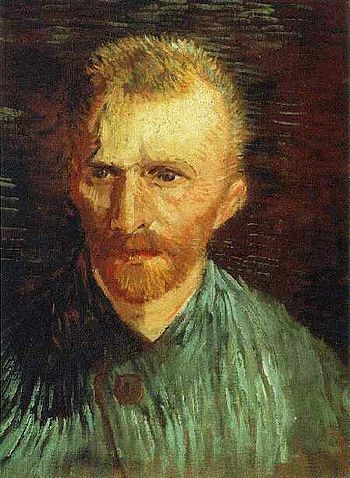 He arrived in 1888 and stayed for about a year. 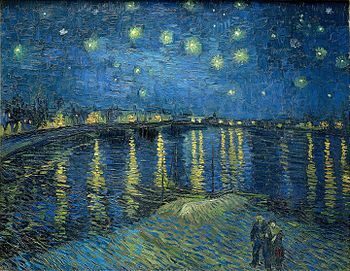 Starry Night Over the Rhone is one of my favorite van Gogh paintings of Arles. 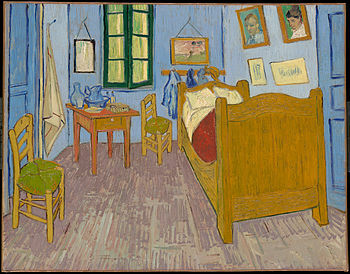 Travel to Arles for a Van Gogh treasure hunt. 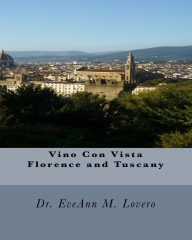 He loved Vino con Vista Arles. 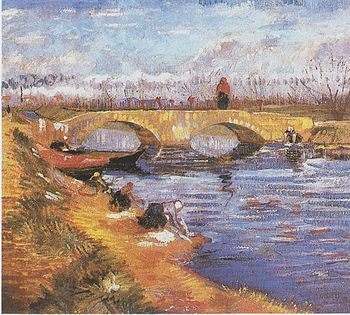 He came here in 1888 and painted many of his famous paintings. This is also where he chopped off his earlobe. Visit the Hotel Dieu, it has been converted into the Espace Van Gogh Gallery. 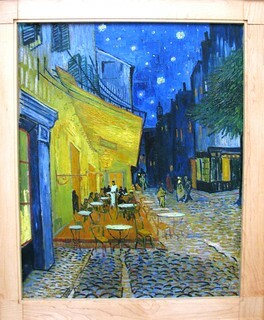 Dine at Cafe La Nuit at Place du Forum; it is decorated like Van Gogh’s painting “Cafe du Soir”. Arles is located between Nîmes and Marseilles in the Bouches-du-Rhône and the area of Provence-Alpes-Côte d’Azur in France. 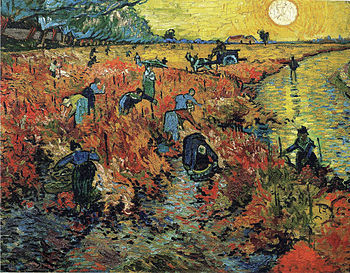 Arles is near the mouth of the Mediterranean where the Rhone River divides into two branches: Grand Rhône and the Little Rhône. This delta is the Camargue region of France. 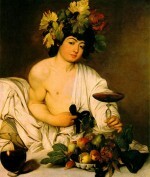 The inhabitants of Arles are called “Arlésiens”. Visit the Musee Arlaten for all things Provencal at 29 Rue de la Republique. Get a Museum Pass at the Tourist Office so you can visit all the interesting sites in Arles with more than 2500 years of history. I love the remarkable Roman treasures: the amphitheater, public baths and arena. In 2007, the oldest bust of Julius Caesar was discovered in Arles and can be seen at the museum. 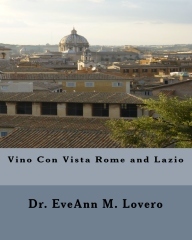 Stroll through this amazing UNESCO site; or plan an elaborate toga party in “Rome on the Rhone”. EIther way, start at the Place du Forum. 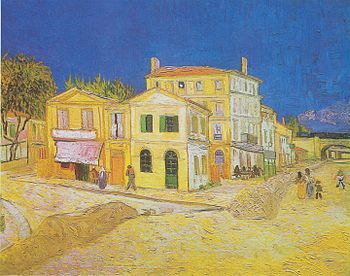 “Like Verona in Italy, Arles is an especially significant example of the appropriation of a classical city by a medieval European civilization. 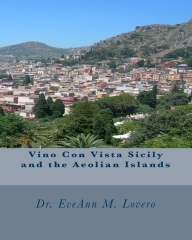 The town, founded by the Phoceans in the 7th century BC as Arelate, owed its prosperity to the decline of its rival, Marseilles, under the Emperor Augustus. It has retained impressive Roman monuments of which the earliest, the Arena, the Roman Theatre, and the Cryptoporticus (subterranean galleries) date back to the 1st century BC. 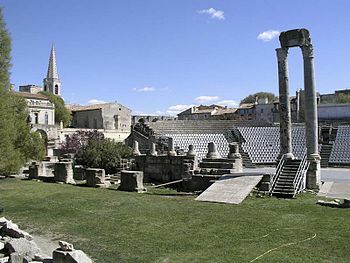 During the 4th century, Arles rose to the rank of political capital and religious metropolis; testimony to this second golden age is provided by the Baths of Constantine and the superb marble sarcophagi of the Alyscamps cemetery. However, in 480 the city fell into the hands of barbarians. The subsequent decline was a cruel one for the city, which did not regain its role as a capital until the 9th century with the creation of an independent kingdom. Successively a territory of the Empire and a possession of the Counts of Provence, Arles was one of the most attractive cities of the Mediterranean world during the Middle Ages. 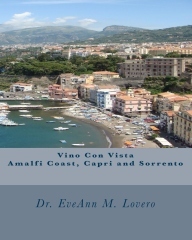 Travellers from many countries described its monuments with enthusiasm. 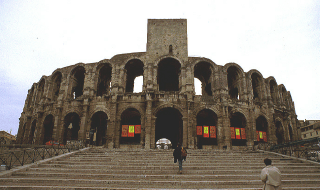 The Roman theatre was built at the end of the 1st century BC. The cavea could hold 10,000 people in 33 rows of seats. The majestic high wall at the back of the stage was decorated with columns and statues; two columns and the collection of sculptures are in the Arles Archaeological Museum. From the 5th century onwards, the theatre was occupied by houses and religious buildings, which were demolished starting in 1834. At that time the semi-circular orchestra section with its precious marble pavement, the space occupied by the machinery used to raise and lower the curtain, part of the seats, and parts of the outer wall preserved in the Tower of Roland during the Middle Ages were restored and conserved. The amphitheatre, built around AD 90, ranks among the great amphitheatres and could hold 20,000 spectators. Gladiator fights and animal hunts took place here until the end of the 5th century. During the Middle Ages, the building became a fortress, sheltering two chapels and 212 houses within its walls. These parasitic constructions were destroyed in 1825. The underground passages of the Cryptoporticus were used as foundations for the Roman forum, the political, commercial, and religious centre of the Roman city. They were built in 30 BC on the side of the hill, and their construction necessitated gigantic earth filling and levelling operations. The U-shaped Cryptoporticus is made up of three double corridors covered with barrel vaults. They intersect at right angles and are separated by rows of massive pillars supporting basket-handle arches. Towards the end of the Roman Empire shops were built, opening on the outer side. In Roman times Arles was surrounded by graveyards, including one situated along the Via Aurelia which later became known as Les Alyscamps. 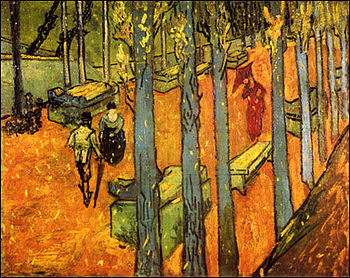 This cemetery subsequently became important when the Christian martyr Saint Genest and the first bishops of Arles were buried there. In 1040 the site became the Saint-Honorat priory, one of the required stops on the pilgrimage route to Santiago de Compostela in Spain. 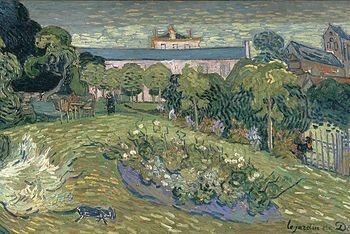 Today a path lined with numerous sarcophagi, painted by Van Gogh and Gauguin, leads to the church of St Honorat at the far end. The latter was rebuilt during the 12th century in Romanesque style and crowned with a splendid octagonal lantern inspired by the architecture of the Roman amphitheatre. The church of Saint Trophime and its cloisters constitute an exceptional Romanesque group, strongly influenced by ancient art. Beside the Rhône the Baths of Constantine were built during the 4th century as part of a complex including several buildings. Still visible today are the hot rooms, the pools, the ventilation system for the hot air circulating within the walls through tubuli (hollow tiles) and between the piles of bricks (hypocausts). 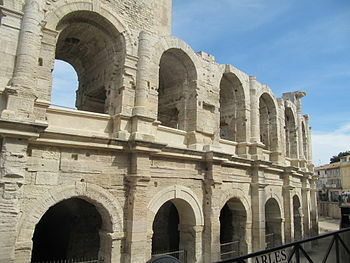 Arles Amphitheater was built around 90 AD to provide a venue for chariot races and bloody battles. Today is serves as a bullgfighting arena and hosts summer concerts. Les Suds à Arles: Suds Music Festival with music, concerts, workshops and classes. Feria de Pâques and Feria du Riz: The traditional “Feriad’Arles” (Bullfights) of Arles, are held from Easter (“Feria de Pâques”) until the end of September at Feria du Riz at the Arles Amphitheater. Grand Hotel Nord Pinus is the finest hotel in Arles, close to the Forum and very popular with the bullfighters.